Do you think your best friend is uncomfortable and suffering due to allergies? Whether it be seasonal or food allergies, your dog might be in need of treatment just like you! However, many veterinarians will want to start them right away on a regimen of anti-allergy drug and antibiotics, but this mode of action indicates that the vet is untrained and uneducated for treating pet allergies. The truth is that there are safer and natural treatments for dog allergies and a root cause of them in their lifestyle. A dog can be allergic in an infinite number of ways to different allergens in their environment. It could be pollen from ragweed, trees, and grass or something irritable like mold, dust and cleaning chemicals that you use around the home. You can generally tell if your dog is allergic to something in your house by observing if their symptoms are year-round. If it is a reaction to something outside, the symptoms will usually be seasonal. Discovering the root cause of your dog’s allergies is very important because when dogs have an allergy, it tends to get worse exponentially over time. You should stop exposure so that the allergy can heal. Don’t smoke around your pet. Consider non-toxic or hypoallergenic cleaning products. Invest in a quality air purifier that can control the amounts of dust and fine particles that you and your pet can be allergic to. Don’t give your pet too many antibiotics. This can stunt their immune system by destroying the healthy gut flora in their digestive tract, which actually helps fight against allergies and build immunity. Avoid steroid treatments because the side effects can seriously affect a dog’s immune system. Make sure your dog is properly bathed. If the dog has irritated skin, rinsing off the allergens will get rid of the problem immediately. The dog will likely enjoy feeling much better after a bath and want them more often. Try to give your dog fresh and pure water that isn’t from the tap. If these actions help your dog’s allergy symptoms, then the root cause is likely hidden somewhere in these tips. Try to think about the chemicals that your dog has been exposed to inside and outside. What cleaning products have you been using on your floor and furniture: where your dog spends the most time? Consider the season and what types of pollen is in high concentration right now in the area that you live. You can easily check the pollen count here. Try to think about the specific times that you noticed allergy symptoms in your dog and correlate it to things in the environment that could be causing it. Would wild dogs come across this substance often? Evolution may not have allowed dogs to sustain long periods of exposure to this substance. By considering your dog’s lifestyle, you can better make a decision about reducing the amount of allergens in their environment. 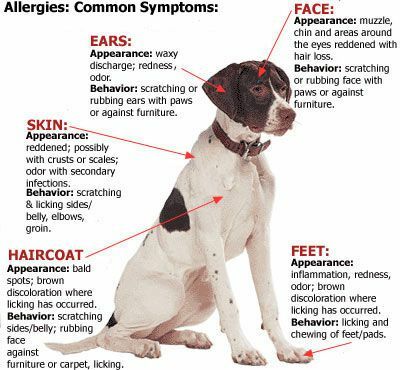 Most people don’t consider that their dog even has allergies, even when they are very apparent on a dog. So it is very thoughtful to consider their health in this way. Some dogs may show mild signs at first, but even so, natural treatments for dry skin or fleas might completely solve the problem. Avoidance of the allergy is the most important part of managing atopy in dogs. It might not be possible to get rid of all the allergens that are causing the problem, but if you are making a conscious effort to get your dog friend away from the harmful substance, it will make a huge difference in their health. Dust: While vacuuming, remove your dog from the area for a few hours because it can kick up dust and other fine particles into the air. Maybe let them outside for a few hours after you vacuum. Dust mites: Wash your dog’s bedding with very hot water instead of warm or cold. Also don’t let your pets sleep on any furniture that is stuffed because dust mites can live in there. The mites can also live in carpeted floor and stuffed pet toys. Mold: Don’t let your pets in your basement or any areas that are prone to a moist environment. Try to avoid pet food that has a dusty consistency. Dehumidifiers also help tremendously at reducing the mold problem in your home. Pollen: Don’t let your dogs run around in large fields if they have pollen allergies. Also try to cut your grass short. If need be, you can keep your pet indoors during the high pollen season. Food allergies are also a huge problem for a dog’s health. If your dog is itching and scratching their skin, their food is 20% likely to be the root cause, after atopy and fleas. However, we do know how to recognize the obvious symptoms of food allergies and how to treat them. Food allergies in dogs have characteristic symptoms of itching and general problems of the skin. They can usually be physically noticeable. Food intolerances, on the other hand, will not create an allergic response. They will cause diarrhea or vomiting, just like in the way humans react if they get food poisoning. Both food allergies and intolerances in dogs can be eliminated if you stop exposure to the allergens. In some dogs, the allergy to dog food might be very apparent, but sometimes the problem can be more than just the dog food. It is important to distinguish all causes of your dog’s allergy symptoms. There’s evidence that a dog could have allergies due to food, fleas, atopy, pollen, parasites, and water all at the same time. In these severe cases, an extensive effort will be required for the health of your dog. A good way to determine what in your dog’s food is causing allergies is undergoing a food trial that consists of feeding your dog a hypoallergenic dog food for a few days while slowly reintroducing foods and making note of the well-being of your dog. These foods will have the least possibility of causing an allergic reaction in your dog’s digestive system. This is in addition to the foods that you are eliminating from your dog’s meals. You should make a journal of all the foods that your dog accidentally consumes. Over the course of about a week or two, you should be able to pinpoint what specific food your dog is allergic to after you slowly reintroduce foods one by one into their diet. If your dog seems to have poor immune health and reacts to many different things that you can’t control, or if you want to improve their general health and exposure to allergens, it would be great to incorporate some of these natural treatments for dog allergies. For years, these nutrients have been recommended to improve coat quality and shine for better overall health of any animal. Omega-3 fatty acids are very important for your dog’s immune system health and regulation of the histamine response that is activated when your dog comes across an allergen. Some dogs start taking an omega-3 supplement and immediately see a cure for their allergies. Perhaps a deficiency in fatty acids could be the cause of their allergies in the first place. This can happen for a number of reasons, but most importantly, their diet could be deficient in proper omega-3 and too high in unhealthy omega-6 fats. Foods that are high in unhealthy omega-6 fats, which harms your dog’s health, include beef, pork, chicken, overcooked eggs and other processed meat products. These foods should be limited in their diet. Food sources that are abundant in healthy omega-3 fatty acids include fish, eggs, and vegetables along with vegetable oils like olive and avocado. Meals can end up being one of the best treatments for dog allergies. An omega-3 supplement is excellent for dog health. You should seriously consider getting them one because it can revolutionize their health. It’s possible that up to 90% of dogs living in houses are deficient in healthy fatty acids. A supplement in conjunction with a diet low in omega-6 fats would be ideal. Biotin is a B vitamin that it important in the healthy regulation of the processes of the skin and hair. It is often used in combination with an omega-3 supplement for excellent results. Dog owners that enter their dogs in shows give their dogs these supplements to improve their dog’s coat, skin, and eye quality. Supplementation with biotin in dogs can result in a reduction in dry and allergic skin. Biotin is very safe with no possibility for side effects or toxicity because it is a natural nutrient that they require anyways. Immunotherapy or hyposensitization has been a primary treatment for atopic allergies in dogs. In animals where avoidance of the allergen is impossible, this is the most likely treatment for allergies for that dog. Antihistamines and nutrition generally won’t help those dogs and immunotherapy is required because their immune system is so unhealthy. The dog will be given a series of shots over the course of a few weeks, which will expose your dog to harmless amounts of allergens so that your dog can build up antigens to deal with the allergen in the future in larger amounts. Over time with repeated slight exposure to the allergens, your dog’s weak immune system may be able to build up a tolerance. This same process is often used for humans. Talk to your vet if you think this is a sensible option for your dog’s allergies. These treatments for dog allergies can be considered natural because you are assisting the immune system of your pet by building up natural immunity, rather than masking symptoms with drugs. A gentle dog shampoo with oatmeal is great for dogs with allergies or itchy, dry skin. Baths will control a number of allergens on your dog’s skin and hair. After an extended period of time of being outside, it would be ideal to give them a quick bath. However, some shampoos can be extremely drying and strip your dog’s skin and hair of natural nutrients and oils that help your dog to remain healthy. The chemicals can also cause a topical allergic reaction. A gentle soap with natural ingredients will gently remove anything from your dog’s fur and skin, while not stripping any nutrients or causing allergic reactions. Washing away the allergens with a bath will be one of the best treatments for dog allergies. If you dog has dog food allergies, it would benefit them greatly to take a digestive enzyme supplement with meals. Trouble digesting dog food is a sign that your dog has poor digestive health, so even if your dog isn’t consuming anything they are allergic to, it would benefit their health to supplement them with digestive enzymes anyways. Enzymes will help break down food in your dog’s stomach and small intestine while helping the dog’s body conserve its own natural enzymes for other purposes. Enzymes are important for digestion, immune health, and detoxification. If all of the enzymes are working to digesting foods your dog is intolerant to, their health will suffer. The same with humans, digestive enzymes are great to keep on hand just in case you or your dog accidently eats something they are allergic or intolerant to, so that you can assist your body in digesting the difficult foods while not stressing out your body, which causes inflammation. Enzymes are one of the most obvious and inexpensive treatments for dog allergies. 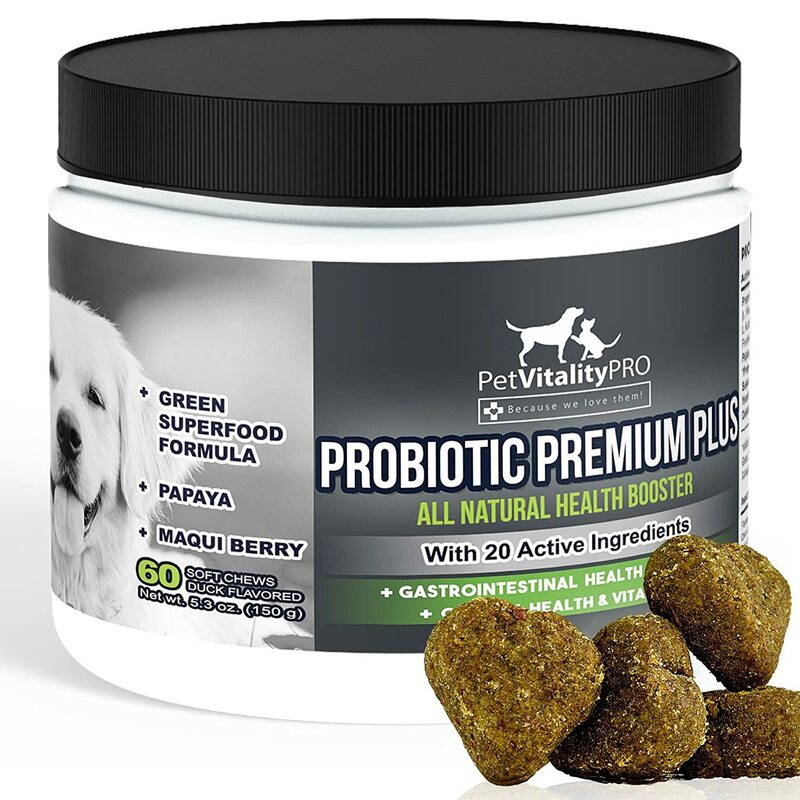 This chewable contains enzymes and probiotics that dogs need for good digestive health. It is highly recommended. Probiotics are essential for a healthy body. These are the bacteria and yeast that live inside our digestive tract that have evolved with us symbiotically over millions of years. They help you digest food, produce enzymes and vitamins, and assist in maintaining a healthy mood. Dogs have allergies just like humans do. It’s likely that your best friend has one or more allergies. It would be so respectable of you as a dog owner to care so much about their health. The fact that you are even reading about their allergies shows how kind and empathetic you are about another living creature. We need to think more about how others feel, especially the ones that can’t communicate. These natural treatments for dog allergies will help them feel better without causing any side effects that can end up being more uncomfortable than the actual allergy symptoms. I am always here for you, so if you have a question or something to add about natural treatments for dog allergies, please leave me a comment below! Does MSM work for her? Great post! My toy yorkie was having some food sensitivities so I switched him to raw with an organic kibble topper free from wheat free, soy free, corn etc. and it seems to work for him quite well. I do notice that gets tearing in his eyes still… sometimes a bit more than usual… any idea on this? There are a lot of allergies that can affect your little puppy. The first suspect should definitely be their food, because animal digestive systems may be sensitive to the variety of ingredients they put in the food. In your case, it might not be the food. You should analyze environmental factors as well. Perhaps the pollen count is high in your area, maybe dust is in high concentrations in your home? If so, the yorkie may be having allergies from the environment. Tearing in the eyes is usually an indicator of that. Let me know! What a great post! I have never considered a lot of these things could cause allergies in dogs. I definitely think it’s better to treat such things naturally, minimising potential unpleasant side effects in our furry friends. Thanks for sharing this. Many dog owners don’t even realize that their pets have allergies too! It hurts me to see them uncomfortable, so I try to take care of them as best I can. Thanks a lot for the input! You are such a kind soul! I love when people take the time to write such great articles on how to take care of their loved pets. This is so well written. Thanks for all the great tips! Thanks a lot for the support! I think we should all deeply consider the health and well-being of our pets. They are like children to me.